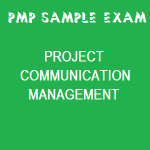 Get an idea of the question pattern and reinforce your knowledge on this subject with 25 free PMP sample exam on project communication management. This typical PMP practice exam by knowledge area facilitates your knowledge revision and study via its comprehensive coverage and refreshes your practice through the easy-to-access format. Inside of the sample is multiple choice quizlets with 4 possible answers, and each quizlet has one best answer. Just click on your choice and hit submit button at the bottom of the page to have your results automatically checked and marked. Work hard and you’ll be in good shape! a. Set the stage by putting the news into context, emphasizing the impact on the bottom line. b. Tell a joke first. c. Tell senior management as soon as possible so they can develop alternatives and recommendations. d. Ask the project champion to deliver the news. Which of the following is not a project communications management process? A _____ report is a reflective statement that documents important information learned from working on the project. A(n) _____ report describes where a project stands at a specific point in time. "Lessons learned" is a method used in which phase of communications management? The difference between communication skills and communication management is _____. a. Communication skills are a plan while communication management is a tool. b. Communication skills are techniques while communication management is a plan. c. They are the same thing. d. Communication skills are a subset of the communication plan. Making needed information available to project stakeholders in a timely manner is _____. b. Do not use facilitators or experts outside of the project team to communicate important information. c. Project managers and their teams should take time to develop their communication skills. d. Use templates to help prepare project documents. a. Is an administrative closure technique. b. combines schedule and cost information in a single report. c. describes the progress made in the last reporting period. d. describes the condition of the project now. a. Lack of proper funding. b. A failure to communicate. Communication between two or more parties performing multi-directional exchange of information is called ______. The project management plan is a(n) _____ to plan communications management. How many channels of communication are there when there are 8 people involved? Which of the following is not a result of information distribution? Which of the following is not a performance reporting method? The last step in the sequence of steps in a basic communications model is ______. The process of creating, collecting, distributing, storing, retrieving and the ultimate disposition of project information is _______. Which of the following is not a guidance to help improve time spent at meetings? a. Invite extra people who support your project to make the meeting run more smoothly. b. Determine if a meeting can be avoided. c. Define the purpose and intended outcome of the meeting. Complex information is best communicated _____. What term describes information that is sent to recipients at their request via Web sites, bulletin boards, elearning, knowledge repositories like blogs and other means? Who is responsible for ensuring that the communication actually delivered the information intended? a. A technique for analyzing cost and schedule together. b. A form of trend analysis. c. A form of status reporting. d. A method of information distribution. Thanks for your feedback to our site, Sam. Hope you have a nice practice. Don’t forget to recommend this site to your friends in order to prepare well the knowledge for the real exam.